Book of Ra has spawned a procession of sequels with Book of Ra Magic another arrival from the Novomatic conveyor belt. This simple 5 reel, 10 payline game comes with a bonus feature that awards 10 free spins with symbols that expand to fill the reel whenever they hit. Play this super volatile game on all devices from between 10p and £500 per spin. If you’ve played any of the other video slots in this series, you’ll have a pretty good idea of what to expect in Book of Ra Magic. That goes for both design and gameplay. The engraved wall of a pyramid chamber forms the backdrop to the reels. There you’ll find Egyptian-style A to 10 royal value as well as an assortment of hieroglyphs. They include the scarab beetle and the bird god Ra which offer payouts of up to 75 times your total bet per payline. Next comes the Pharaoh who delivers awards of up to 200 times your stake per payline. The Indiana Jones-style treasure hunter is the game’s top payer. Land 2, 3, 4 or 5 of him in combination and you’ll pocket an award equal to 1, 10, 100 or 500 times your stake. Book of Ra Magic comes with a Free Games feature which is triggered by landing 3, 4 or 5 scatters (the Book of Ra) on the same spin. As well as receiving 2, 20 or 200 times your stake, you’ll also be awarded 10 free spins. Before the feature begins, 1 symbol is chosen at random. Whenever this specially selected symbol, hits it will expand to fill the whole the reel. If you manage to retrigger another round of free spins, another symbol will developer expanding properties. In total, you can play with 9 special expanding symbols – this makes it easier to fill the reels with the same symbols. Like the other video slots in the Book of Ra series, this is a very straightforward game. It’s also an extremely volatile one. The variance here is very high and you can expect some lengthy downward spells – saying that, there’s a whopping 5,000 times your bet to be won on every free spin if you fill the screen with the adventurer character. Land the Free Games feature with a high value expanding symbol and then retrigger, then the action in Book of Ra Magic can conjure up a pretty enticing spell. 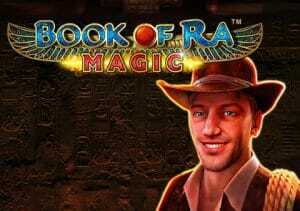 I encourage you to try Book of Ra Deluxe 6 which has 6 paylines and has bigger potential payouts if you’re lucky.